Little House Home Arts: Epiphanies, The Beginning of a New World! Epiphany comes in different forms, but for me, it sometimes comes when I am reading and learn something that is potentially life-changing. I suddenly gain insight into myself, and with new clarity about what doesn't work in my life, set about changing my behavior. 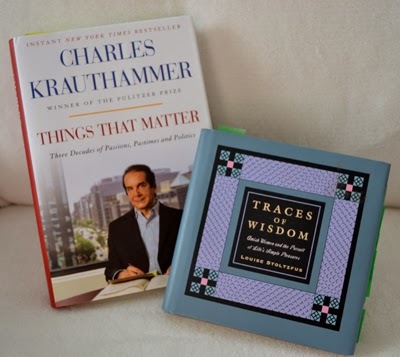 I had such a moment reading Charles Krauthammer's book, Things that Matter. Such insights, quite literally, expand my world , though it is no accident that Charles Krauthammer's book could have such an effect, as before becoming a syndicated writer and political analyst, he was a psychiatrist and his insight into human behavior is well-trained. He called the phenomena, a cousin of solipicsism, when a person fails to recognize "the otherness in others". He went on to say that most of us, don't believe that the world is really an extension of ourselves to the degree that we are out of touch with reality...but find comfort in thinking that the world shares a unity of belief, which is just like our own and went on to say that world becomes a warmer and friendlier place when we picture it with (nice) people like ourselves. He also indicated that if stretched, commonalities between people can be found at basic levels, but that our vision can be very narrow when we believe that others beliefs, thinking and cultures are, in fact, the same as our own. This essay went on to express how naive and ludicrous our leaders can be to think that foreign countries all hold to our same western values and thinking as us. The light bulb turned on in my head. Instead of applying this realization to the world at large, I applied it to my small world and was almost blinded by my enlightenment. I realized that his description of this "narrowness of thinking" fit me to a tee. I couldn't be more naive myself, in thinking that others think like me and consequently I am often astonished why they don't do what I would have thought would be the only logical and considerate thing to do in a given circumstance. I am often disappointed by others behavior and it seems the older I get the more this is happening and yet this new truth brings with it a new hope, for I realize that my disappointments in others are truly of my own making. Quit thinking that everyone is like me, recognize the "otherness" in others and change my expectations and "Voila!" no more disappointments in others for failing to meet my expectations!!" I am now on my way to Nirvana, joy and peace with others and myself--the beginning of a new world, albeit my own world!?@? It may not be quite so easy however as I am learning that I have a well-fortified inner system of "shoulds" that I believe emanates from the thorough training of my mother. Her lessons in behavior and thinking ran deep and permanently modeled my ways into the deep recesses of my mind. I learned to think like her and anticipate how I was to act. Her training was so complete and long-lasting enough that when taking care of her in her old age, I carefully instructed others as to what her unspoken expectations were to eliminate "wrinkles" in her care. A counselor at that time reinforced this behavior by wisely instructing me that "old dogs can't learn new tricks". Indeed for the first time ever I got along with her famously, with no more mother-daughter hair-pulling battles that had hallmarked our history! I came to accept her for the person she was and no longer expected her to change and be like me. Her ways were not easy and it took patience and perseverance to work with or for her. Even her house cleaners noted her to be very particular and instinctively learned read her facial gestures...an eyebrow up and an intent glare left even the most disarmed and naive to know that something wasn't right. I loved and stood by her, much like a parent does with a naughty child and actually came to enjoy her lack of reserve and blunt frankness that before her decline had been masked with sometimes a coldness that was enough to chill most anyone. Only years before, another epiphany happened while I was on vacation and picked up Traces of Wisdom, Amish Women and the Pursuit of Life's Simple Pleasures by Louise Stoltzfus. It was about Amish culture and I soon realized it described the way I was raised right down to the sayings that were quoted. My mother, was surprised that I hadn't understood that her ways had come from a Pennsylvania/Dutch culture of her ancestors. I thought they were ways peculiar to just my mother, and in the extreme, might even represent some sort of psychiatric disorder. She could be unforgivably strict, almost to the point of shunning should I not conform to her ways, which were mostly not verbalized as much as lived. It has taken me years to untangle, recognize and appreciate this intricate and complex culture, and thanks to Louise and Charles, I am still realizing that its effects live on in me and can sometimes be less than functional in a community that doesn't aspire to them. I can indeed be "a foreigner" when it comes to living in the modern day "English" world and culture clashes are not infrequent, and I am often the one that isn't "in-line", only I thought just the other way around! These epiphanies have cracked the thick walls of what I now understand to be well-ingrained Pennsylvania-Dutch ways and light is shining through. I excitedly shared my epiphanies with my husband and he smiled, and confessed that it will be very nice to not be measured with my "Jane-standard measuring stick" anymore! BUT......now I carry a cane and am wondering if I just need a bigger and more threatening stick to "drive home" my points, as it is still hard to believe that the world wouldn't be a better place with more people that think and act like myself!!?? It is not easy to live as a foreigner in a foreign land where others are in fact very different! The epiphany of realizing that my thinking is NOT like everyone else's is indeed a startling and shocking revelation. What is that saying about old dogs NOT learning new tricks? I truly do see the ludicrousness of my thinking, though it truly will be more difficult to change than I thought. I am so ingrained in thinking that my logic, like that of my mother's, is the only logic! I am learning that changing myself, however difficult, might be easier than waiting for the world to be like me!